Why isn't this cow happy? Meat eaters of the world have many enemies. They can come in the form of PETA or a hamburger that someone has decided to ruin with lettuce. One of the newest enemies, however, can’t be easily remedied by making fun of vegans or by sending food back to the kitchen. This enemy is global warming. This is terrible news for a planet with growing temperatures. This decrease in quality could lead to soggy pork and bland steak, putting unvegans, carnivores and meat eaters in danger of having to find alternate meat sources. The consequences could be disastrous, so please, for the sake of meat eaters everywhere, do your part to end global warming. I like how you didn’t mention all the methane gas cows produce. They say 18% of the greenhouse effect is caused by methane, which makes it the second most offending gas (carbon dioxide is the first). In other words, if we didn’t breed so many cows for their meat, we wouldn’t necessarily be in this situation, or at least it wouldn’t be as bad. True, cows produce a great amount of methane, which is not good for the environment. Even worse than that, however, is the clear-cutting of forests for plant agriculture. This destruction of trees leads to even greater amounts of carbon dioxide in the atmosphere. Also, although not fully utilized yet, methane emitted from cattle can be used as a natural fuel source, where cutting down forests only leads to greater devastation such as soil erosion and desertification. You think they’re clearing the forests to plant food for people? You need to check your facts. 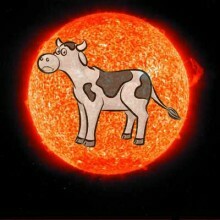 And as for using the methane from the cows for energy, the cows need to be alive for that. They tend to produce more methane that way. Also, we’re only talking about the methane from cow crap, not cow flatulence, unless they’re planning on jamming a tube up there or something””which wouldn’t surprise me. According to British Environmentalist Dr. Norman Myers, cattle ranching only accounts for 5% of deforestation. A whopping 54% is due to slash and burn agriculture, which is most often done for cultivating crops. It is sometimes used for animal pastures, but typically after the soil has been degraded. For further info on either of these subjects, feel free to check my sources. Yes, much of the deforestation is due to plant agriculture, but most of that cultivated land is growing crops to feed livestock, not people, at a huge loss in efficiency. If they were growing crops directly for human consumption, only a fraction of that land would be required to meet their dietary needs. Yes and no. The truth is that livestock would be much happier and healthier if they were eating their natural foods, rather than crops like corn. These natural foods (grasses) can be found all over the place, so I don’t know why people would clear rainforest to grow crops that cattle don’t actually eat naturally. Nonetheless, I think we can agree that any cutting down of the rainforest is a bad idea.